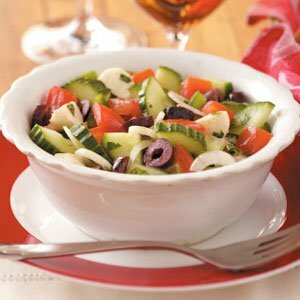 In a large bowl, combine the tomatoes, cucumber, green pepper, onions, olives, parsley and basil. For dressing, in a small bowl, whisk the oil, vinegars, sugar, salt, oregano and pepper. Pour over salad; toss to coat. Cover and refrigerate for at least 15 minutes. Just before serving, stir in cheese. Serve with a slotted spoon. Makes 8 servings.